I used OPI Alpine Snow Matte as a base for all nails with OPI for Sephora What's a Tire Jack? Matte for the musical notes. For the grammy, I used a mix of Zoya Angelina and Nubar Milk Chocolate Creme for the base, China Glaze 2030 from Khrome Collection for the metal part of the grammy, with Zoya Angelina and China Glaze White on White to shade and highlight the metal.Two coats of Seche Vite top coat to top everything off. Personally, I don't think the Grammys have much to offer in terms of quality music, so I am not watching. But I adore your nails. I'm going to steal this idea! Minus the award, of course! The Grammy's have sucked for years. 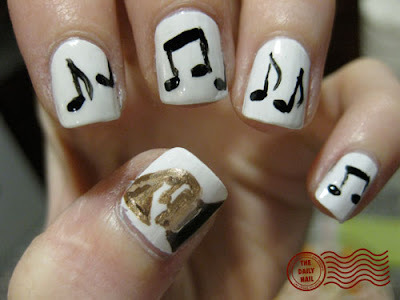 The nails will always ROCK! Gosh you are so talented! Super cute gramophone. I did my first attempt at freehanding today, I wanted to try this for a laugh. I just discovered this blog the other day, and I am in true love!! i nominated you for a best nail-blogger award! personally i think taylor swift didn't deserve any of the awards she won!